A real honest to goodness Ezme is tomato and spices and green onion, and sometimes peppers all chopped and mashed into a condiment, but I was really thinking “salad” as I tossed this together from what I had in the pantry and fridge. This salad is cool and refreshing with a slight heat from the Sweet Chili Sauce that I used instead of spices to bring in a bit of sweet heat. It has just a little zing from the red wine vinegar and the bit of tomato paste just rounds the flavors out and intensifies the tomato in the salad. Think of the dressing in this salad as being kind of a perky Catalina dressing. Bell Pepper and Tomato Salad “Esme” is one of those dishes that’s going to make you sit up and take notice. Best of all, it’s drop-dead simple and seems to go over equally well with adults and children (watch the heat level, though, if serving “littles”.) That hot pepper is completely optional and the bit of Sweet Chili Sauce isn’t hot enough to make the salad spicy. Of course, feel free to add more if that’s your thing. This little salad has become a quick and handy go-to all summer long at our house. It’s best with great tomatoes, duh, but will simply transform a grocery store tomato. If you’re like me, you’ll find yourself craving this salad with it’s sweet/spicy flavors and making it all the time. Because it takes a bit of time for all the flavors to blend in this simple salad, this is a great make-ahead option for dinner or a party or potluck. It just gets better with time. I’ve started riffing on this quick little salad, making extra just so that I have leftovers. Then I change things up. I might toss in some chickpeas, couscous or rice or another grain like farro or bulgar. If I have a little bread that’s getting crusty, I’ll add it right into the salad and make my own little spicy Panzanella. You can’t go wrong with tossing any leftover into the food processor and breaking it down a bit then spooning it over hummus or serving it on a flatbread or crostini. Maybe with a little Feta cheese. It’s like a sweet tangy salad condiment salsa all rolled into one easy little recipe. Yogurt Marinated Shish Kebobs with the Turkish Rice peeping out – the rice was browned a bit more, here. Your greatest savings and the greatest taste is going to come from buying these ingredients in season. Any tomato from heirloom to cherry tomatoes can be used, and any color of pepper, too. Pick your produce, like the tomatoes & peppers up on sale, and buy enough for the next week, too, as both keep well. When choosing tomatoes, choose a mix of ripe and not quite so ripe. 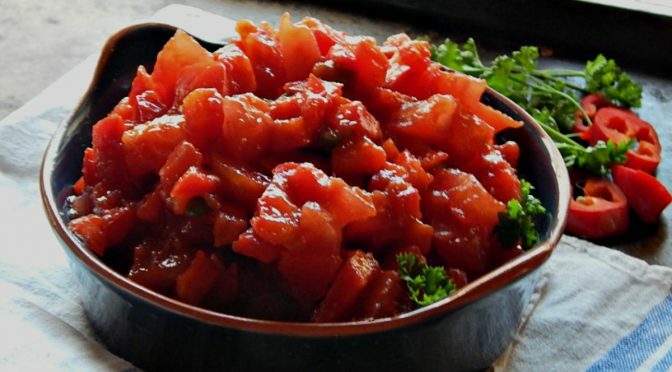 Sweet Chili Sauce is the surprise ingredient in Bell Pepper and Tomato Salad “Esme”. I try to pick up my Asian ingredients during the New Year’s sales, often unadvertised. If you have an Asian market nearby, you’ll be surprised by the low prices. Tomato paste goes on sale regularly and is one of those items that often have coupons. Keep your eye on your coupon matching site (it’s worth it – they note great bargains whether coupons are used or not) and stock up when it’s at a low. Vinegar – buy for the year during the Easter sales, or on sales sporadically through the summer. A fun, fresh and easy play off of the Turkish salad Ezme. It’s a perfect summer side. Cut it finely or leave in larger chunks. Mix the together the bell peppers, tomato, hot pepper if using, along with green onion & parsley. In a small bowl, mix the Sweet Chili sauce, tomato paste, red wine vinegar, sugar and salt and pepper to taste. Pour over the vegetables and mix. May be served immediately, but best if it has some time to sit, an hour or so. Keeps well for several days. Salad may be chopped finely as a condiment, or in small or bite-sized pieces depending on your preference. Tomato and Bell Pepper Salad “Ezme” made May 2012 for $1.35, remade and repriced March 2014 for about $1.40. This entry was posted in Click here for Fabulous Food Posts and tagged Bell Peppers, Condiments, Ezme, Green Onion, Salad, Tomato paste, Tomatoes, Vegetable Side, Vinegar. Bookmark the permalink.